Traditional metal braces are the most common type of braces. They are more comfortable today than ever before. 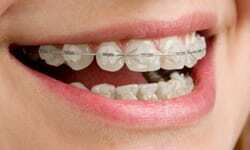 Made of high-grade stainless steel, metal braces straighten teeth using metal brackets and archwires. With metal braces, patients have the option of adding colored elastics (rubber bands) for a unique, personalized, colorful smile. Ceramic braces are an aesthetic alternative to traditional metal braces. They are made of clear materials and are therefore less visible. Although less visually prominent, ceramic braces are larger and more brittle than their metal counterparts. They require more attention to oral hygiene and since they fracture more easily, and they also require complete compliance with orthodontic food restrictions. Invisalign® is a series of invisible, removable aligners. The aligners move teeth into straighter positions until you have a more beautiful smile. Unlike conventional braces, these clear aligners can be removed when you eat and brush your teeth. Each set of trays are worn for about 2 weeks and are removed only to eat, drink, brush, and floss. As you replace each tray with the next in the series, your teeth will move – little by little, week by week – until they have straightened to the final position. Consider Invisalign treatment to get the beautiful straight teeth you’ve always wanted — without braces. A complimentary consultation with our doctor can determine if Invisalign clear aligners are right for you.